I just noticed that Tuesday’s review wasn’t posted for some reason. I assume it was a problem with the scheduling. I apologize for that. Here you go. Going along with my new acceptance of rollerballs, and wanting a finer option for my Retro 51, I bought this pen on the recommendation of one Mr. Brad Dowdy as one of his top 5 liquid ink pens. After testing this for a couple months, I have to say it definitely deserves a place on that list. 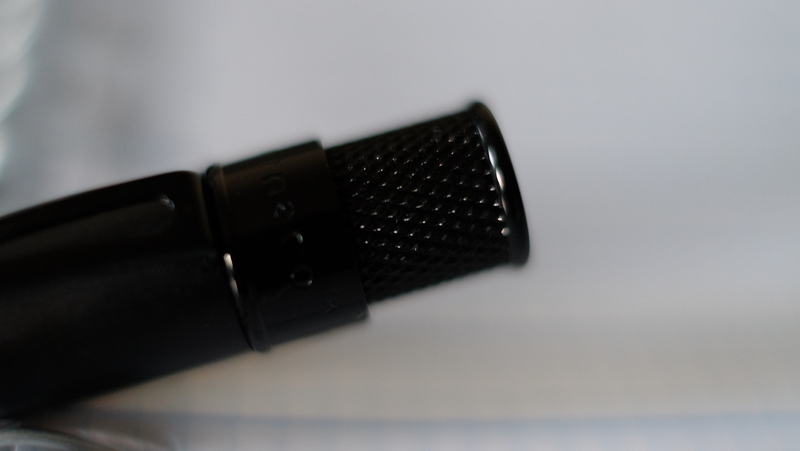 For merely $2.00, this pen lays down a smooth and consistent line, the cap posts snugly, the body has a nice heft to it, the grip is functional and the ink window is convenient. 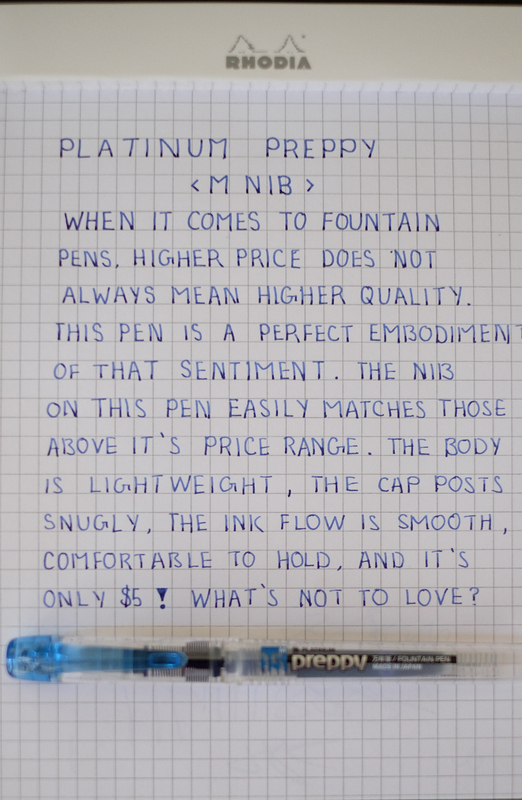 For a pen that provides so much value for it’s price, I’m perplexed at how it’s not more popular. I was really in desperate need of a subtle blue-black ink when I purchased this bottle. I had nothing but vibrant inks, and I wanted something more professional looking. Enter Noodler’s Bad Blue Heron. 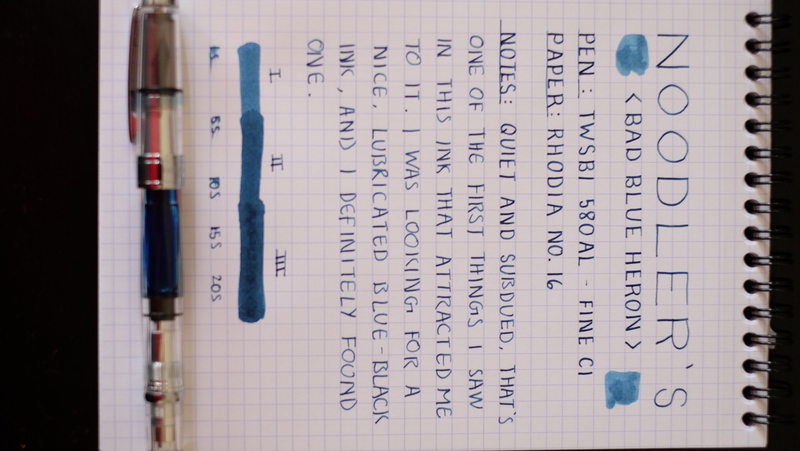 It was by sheer coincidence that I managed to try this ink out. I was at the L.A. Pen Show, and I was learning about the history of Spencerian script from the master penman Michael Sull himself. I was seated next to a gentleman who was using a Matte Black Pilot VP to take short notes. Coincidentally I was using the same pen, but with a different ink. We left the pens to close together and I accidentally picked his up and started to jot down something. 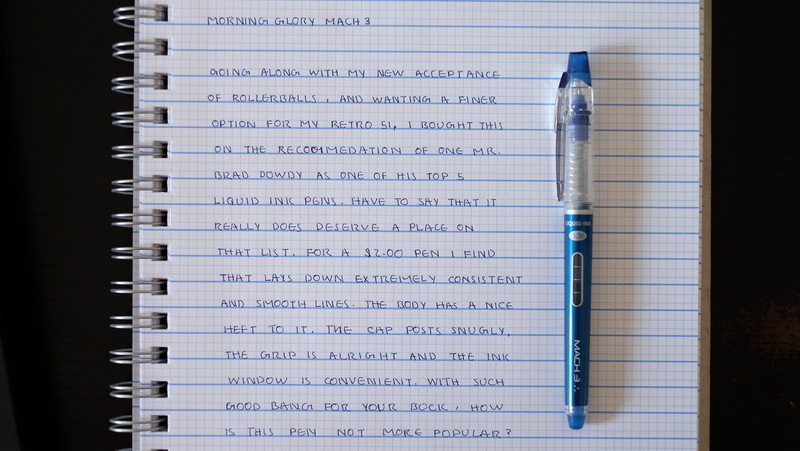 It was at that moment that I felt how amazing this ink was. It made the nib of the VP glide over the DotPad I was using. I was surprised and quickly apologized for the mistake. Almost immediately after seeking forgiveness, I asked him about the ink he was using. He told me that is was his personal favorite and that he uses it in his pens with bigger nibs to accentuate the shading. I proceeded to go down to the Anderson Pens table and immediately secure myself a bottle. 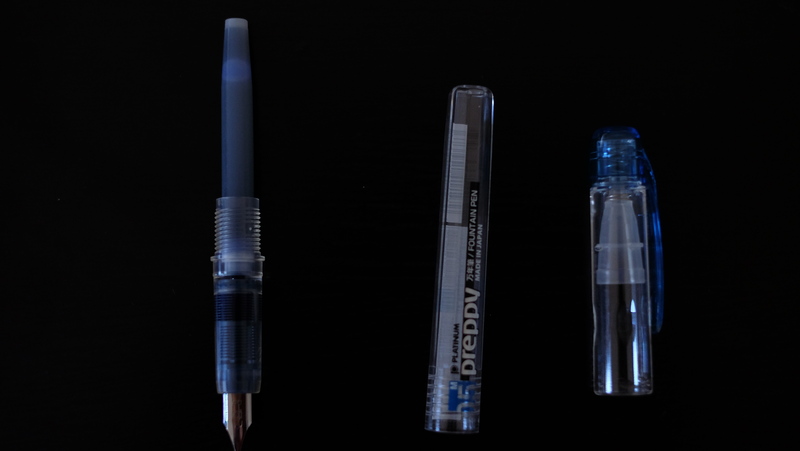 The ink was slowly incorporated into my pen rotation, and I’ve never looked back. 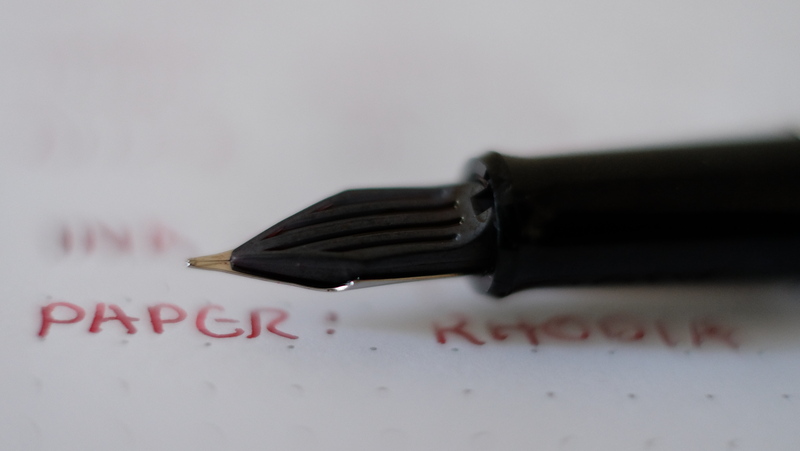 Over the months of use I have not experienced any degradation in writing experience and I always look forward to inking one of my pens up with it. 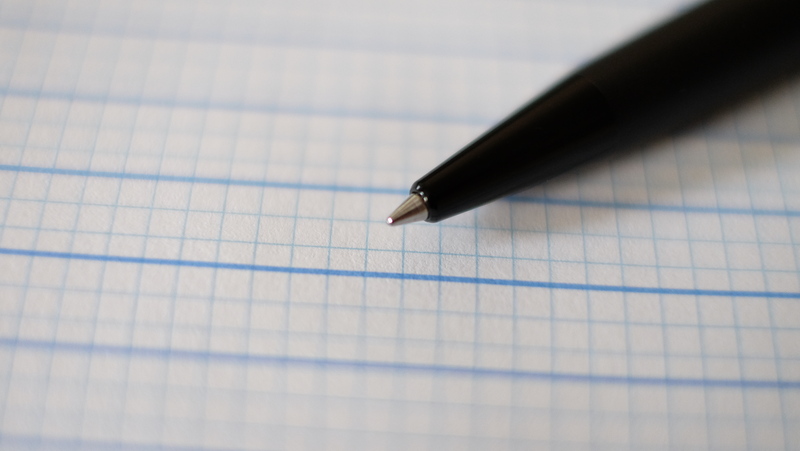 No matter which pen I’ve used it in, the flow was smooth and consistent, it helped the nib glide over the page, laid down saturated characters and turned out to be bulletproof as well. All in all, this is one of my favorite go-to inks for any official correspondence as well as filling out forms. 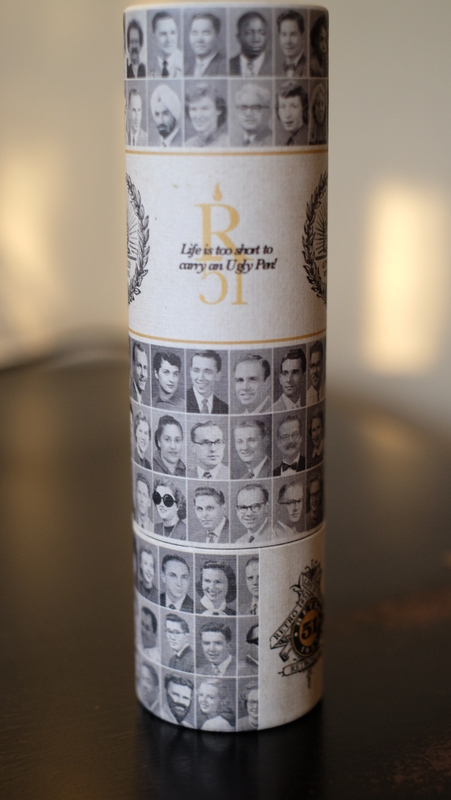 It looks great on a white paper, and the color is subdued and easy on the eyes. Wow. That’s all I could say when packaging to the Retro 51. After hemming and hawing for 5 months, I finally pulled the trigger on the Deluxe Matte Black Edition. I proceeded to add it into my school pen rotation for the following month, and I’m happy to report it is now earned a permanent place there. This month with the Retro 51 was enlightening, to say the least. I was always rather biased against rollerballs and how they wrote, due to a horrible experience with one a few years back. It felt near impossible to write with, and I was turned away from rollerballs for the longest time. After all this time, all the reviews and recommendations from fellow pen addicts including my idol Mr. Brad Dowdy himself, I finally decided to pull the trigger on one. Now I’m asking myself why I didn’t do it earlier. The first impression anyone will get from the Retro 51 is how gorgeous it is. The problem with matte furniture on any pen is the risk of scratching. One scratch can absolutely ruin the aesthetics. While some tend to embrace them as badges of honor, I find myself thinking that I have ruined a perfect work of art. After a couple of accidents, I found that the finish is almost bulletproof. I dropped it on carpeting, wood, concrete, tile and other surfaces (I can be very clumsy). It still came out smiling and after a quick wipe with my finger, it returned to being as immaculate as when it first arrived. Now on to the most important topic that I wanted to talk about. The writing experience was enlightening, as I mentioned before. Why? In a few words: I found rollerballs actually gel pretty nicely with my writing style. Now this came as a huge surprise to me, and I found myself thinking why. 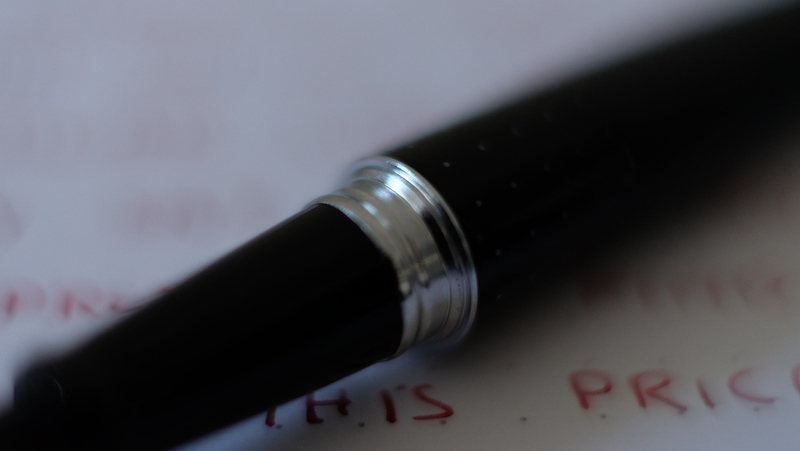 Since the time I wrote with that old rollerball, my writing style has drastically evolved. What was an absolute mess to use back then, is pretty comfortable and nice to use now. 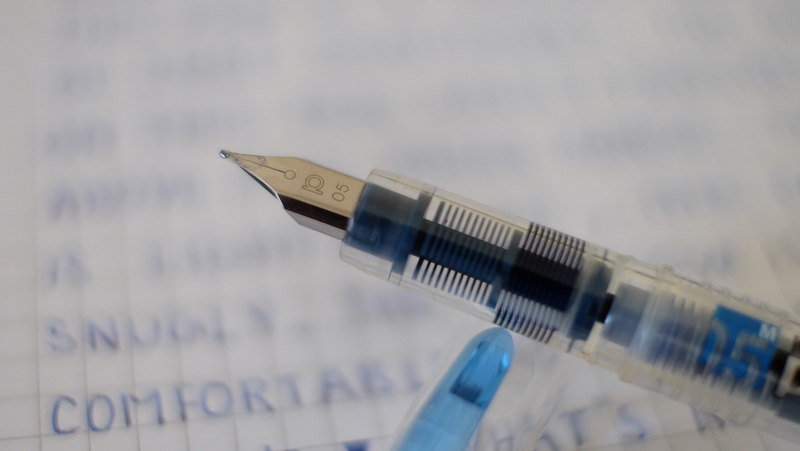 The refill provided is the Retro branded Schmidt P8127, a 0.7mm rollerball refill. I found the ink flow to be smooth and consistent straight out of the box, and there were virtually no problems to be seen. While I really like this refill, I find myself wanting one slightly smaller than this size. 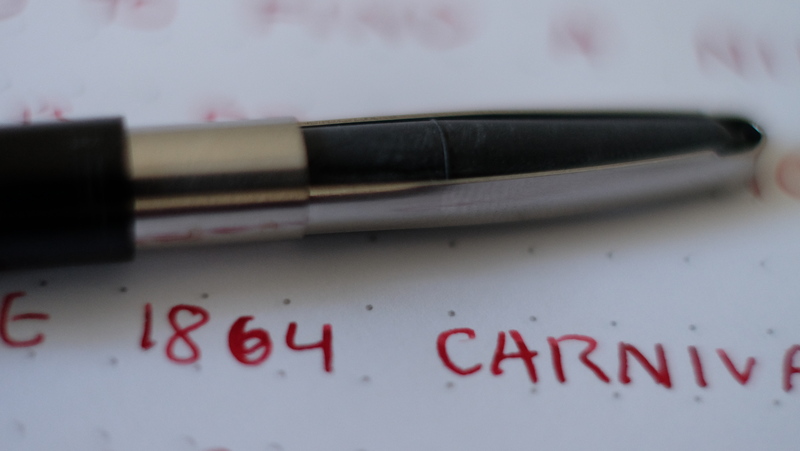 Through a little digging, I found that Schmidt has a another refill, the P8126, which can be used with all Retro 51 pens. After viewing the review put out by Mr. Brad Dowdy, I was drawn towards it. Maybe after I finish the current one (which will be soon at this rate), I will opt for the P8126. The knock, which is a trademark of the Retro 51 model lineup looks stunning in black. 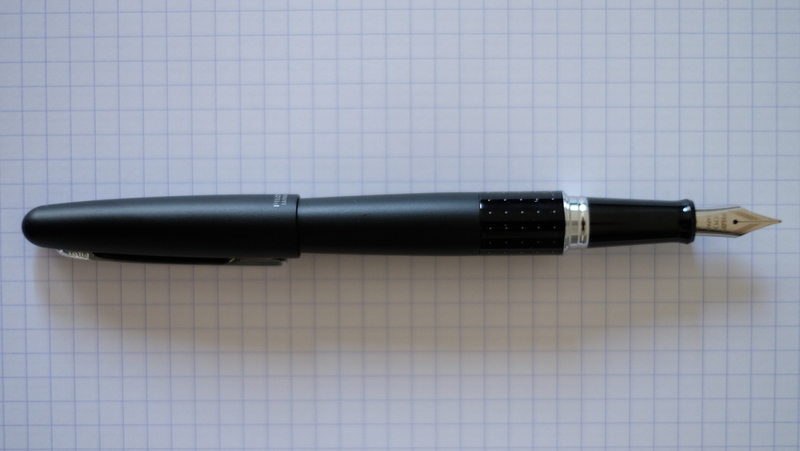 I initially expected the Retro 51 to be a click pen, but after a bit of research it turned out to be a twist pen. I feel the knock really comes in handy for getting a good grip to twist out the nib. While adding to the overall aesthetic, it manages to be functional as well, which is a difficult balancing act to pull off. All in all, I am very happy with my decision, and with how solidly this pen is built, I expect it to last a long time. I look forward to adding a couple more to my burgeoning collection. My fall quarter started today, so back to school it is. However, as promised, I will be holding a Welcome Back Week of Reviews. For this week (starting today), I will be posting a minimum of 1 review per day. One of the days (most likely Friday), I will be putting out all the ink reviews I’ve been procrastinating for months now. That totals to about 6, I think. I’ll be posting a couple of paper reviews over the weekend, so look forward to that. It’s gonna be a hectic week with homework and all, but I just love you guys that much. So without further ado, here’s what you’ve all been waiting for. 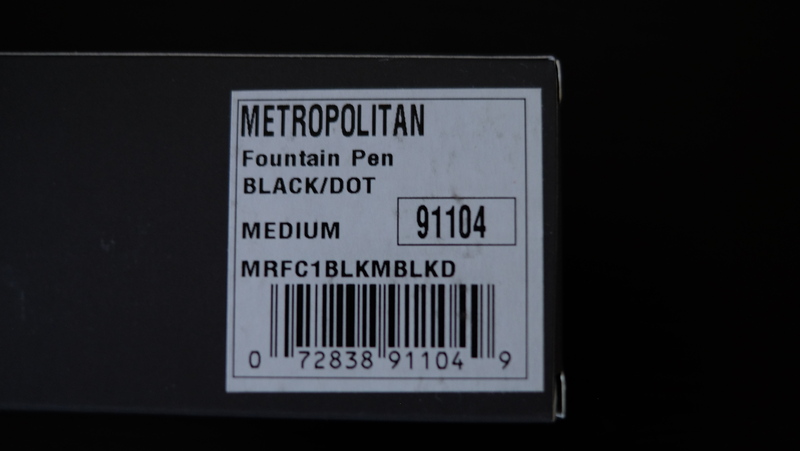 For a budget pen that is usually a “first fountain pen” for a lot of people, the packaging is really nice. 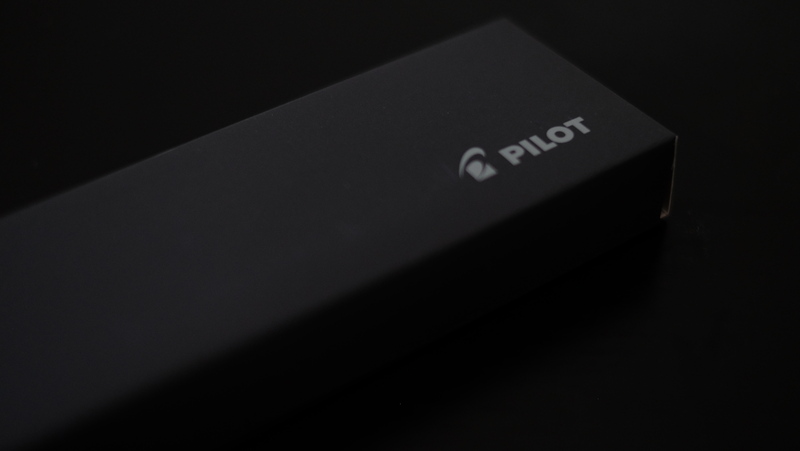 Mind you, it doesn’t compare to Pilot’s more expensive options, but it’s nice nonetheless. It reminds me a lot of the tins in which I stored my Camlin geometry set. Thin yet durable, secure when closed, and easy to open. The one visible drawback would be the plastic window being a huge dust magnet. One of the first things I noticed out of the box, was the size of the pen. Photos can be deceptive, as it is longer than it looks. 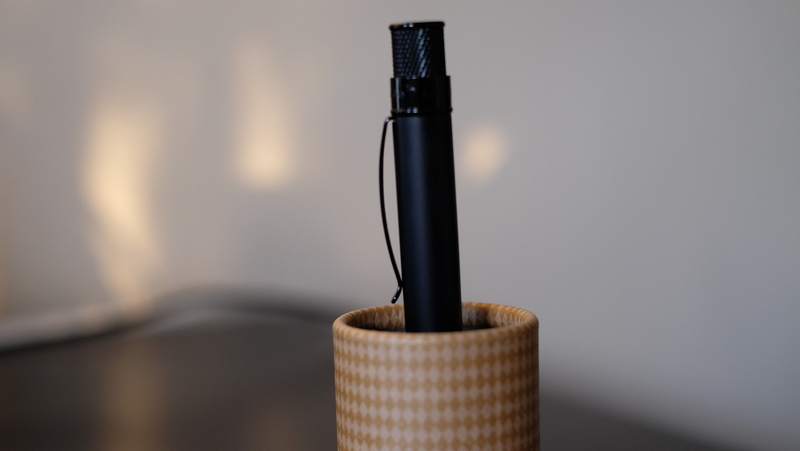 Albeit being slimmer overall, the length is comparable to that of a Lamy Safari. The heft was noticeable when I lifted it. The weight was distributed more towards the front, but was balanced very well. 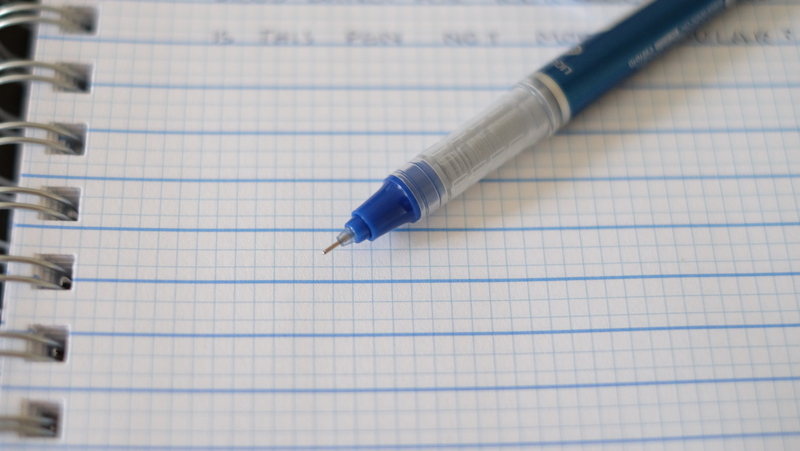 For a plastic pen, it sure doesn’t feel cheap. Once uncapped, there was a noticeable decrease in weight, but it maintains balance well. This is where I discovered my first problem with this pen. As you see in the picture above, the transition from the barrel to the grip is too sharp. This results in a rather annoying edge which feels uncomfortable if your grip is too hard. On the positive side the pen posts very well. While I usually post my pens, this one didn’t require it. Even without posting, the length is comfortable in my hand (and I have big hands). This is one thing that surprised me, as I thought that I would definitely need to post. However, anyone who wants to post can do so. When posted, the weight is still balanced nicely, and the cap is secure. 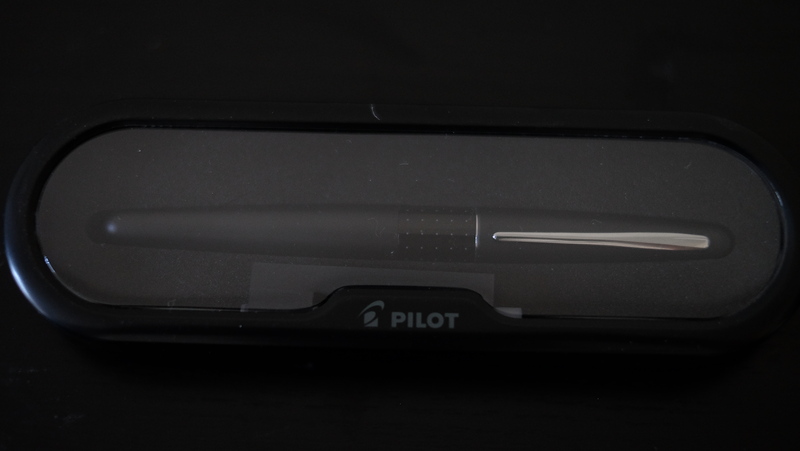 I opted to get the M nib, as I was seeking a writing experience and line width similar to my Pilot VP. After a couple of hours of use, I’m really impressed with how good this nib is. 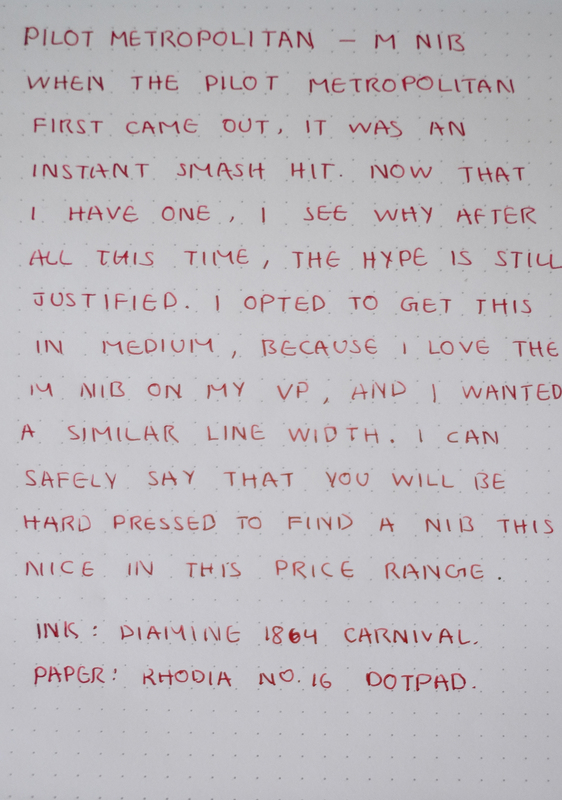 I can safely say that at this pen’s price point, you will be hard pressed to find a nib that performs like this. Not that I had any doubts of course, with Pilot being so strict with their QC. 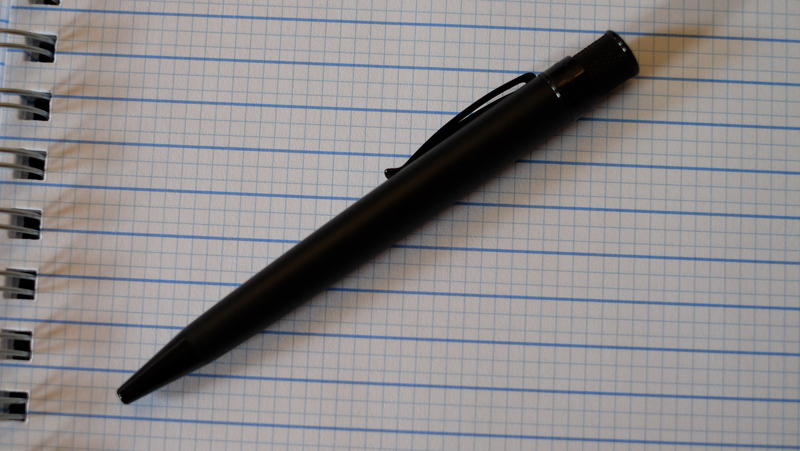 It wrote like a dream when I had just filled it up, but the experience slowly deteriorated with the declining ink level, which brings me to my main quibble with this pen. When I unscrewed the barrel, I was greeted with the sight of a Pilot squeeze converter, which made me cringe. These are cheap and hold the least amount of ink possible. While I wasn’t expecting a Con-50 coming standard, I thought to replace it with my own spare one. Lo and behold, no matter how hard I pulled, the converter wouldn’t budge. After putting as much pressure as I could possibly muster, the converter finally gave in and popped out. I fitted my spare Con-50, and inked it up. The skipping problem I was initially having disappeared like it never existed. So my advice would be to either have a spare Con-50, or purchase one along with your Metropolitan, as the standard converter is not even worth mentioning. All the hype I hear about this pen has all been justified after using it for some time. I find myself thinking about why it took me so long to purchase and review it. Since it’s release, this pen has come a long way. Pilot has expanded the colors and patterns to cover the tastes of a large amount of people and have kept the quality at a decently high level. 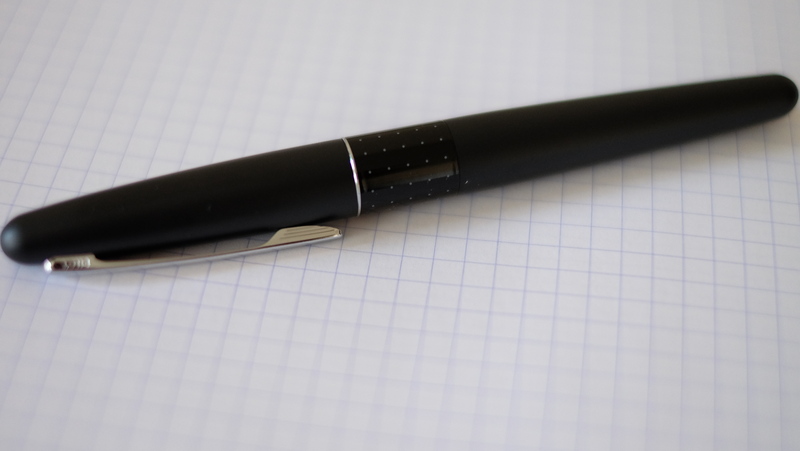 While not perfect this pen performs better than any I have ever used at its price range. 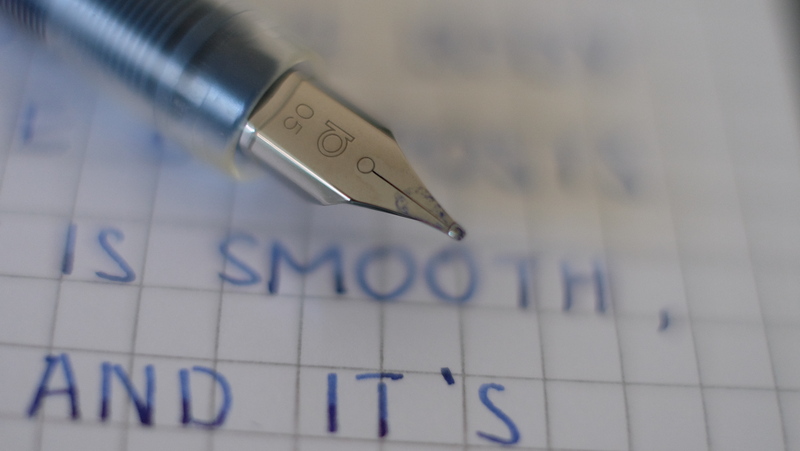 It truly is one of the perfect starter pens and will last a long time. I highly recommend this pen to everyone who wants a cheap, durable pen that performs beyond its’ price range.